Matthew Lettich is a practicing Attorney whose area of practice is primarily involved in bankruptcy representing both debtors and creditors. His other specialty is immigration. 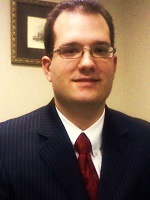 Matthew is affiliated with John J. McManus & Associates, PC. Their main office is located in Tucker, however Matthew is fairly well known in Gwinnett County since he has spent most of the last three and a half years practicing in the field of bankruptcy in Lawrenceville, where they currently have a satellite office. His firm has also conducted real estate closings, foreclosure, foreclosure defense, litigation, family law, and other assorted fields in which he’s been involved in various degrees.